Traditional retail is in the centre of a storm - and British department store chain House of Fraser is the latest to succumb to the tempest. The company plans to close 31 of its 59 shops - including its flagship store in Oxford Street, London - by the beginning of 2019. The closures come as part of a company voluntary arrangement, which is an insolvency deal designed to keep the chain running while it renegotiates terms with landlords. The deal will be voted on by creditors within the month. Meanwhile in the US, the world’s largest retail market, Sears has just announced that it will be closing more than 70 of its stores in the near future. This trend of major retailers closing multiple outlets exists in several Western countries – and its magnitude seems to be unrelated to the fundamentals of the economy. The US, for example, has recently experienced a clear decoupling of store closures from overall economic growth. While the US economy grew a healthy 2.3% in 2017, the year ended with a record number of store closings, nearly 9,000 while 50 major chains filed for bankruptcy. Most analysts and industry experts agree that this is largely due to the growth of e-commerce – and this is not expected to diminish anytime soon. A further 12,000 stores are expected to close in the US before the end of 2018. Similar trends are being seen in markets such as the UK and Canada. Perhaps the most obvious impact of store closures is on the revenues and profitability of established brick-and-mortar retailers, with bankruptcies in the US up by nearly a third in 2017. The cost to investors in the retail sector has been severe – stocks of firms such as Sears have lost upwards of 90% of their market value in the last ten years. By contrast, Amazon’s stock price is up over 2,000% in the same period – more than 49,000% when considering the last 20 years. This is a trend that the market does not expect to change, as the ratio of price to earnings for Amazon stands at ten times that of the best brick-and-mortar retailers. Although unemployment levels reached a 17-year low in 2017, the retail sector in the US shed a net 66,500 jobs. Landlords are losing longstanding tenants. The expectation is that roughly 25% of shopping malls in the US are at high risk of closing one of their anchor tenants such as a Macy’s, which could set off a series of store closures and challenge the very viability of the mall. 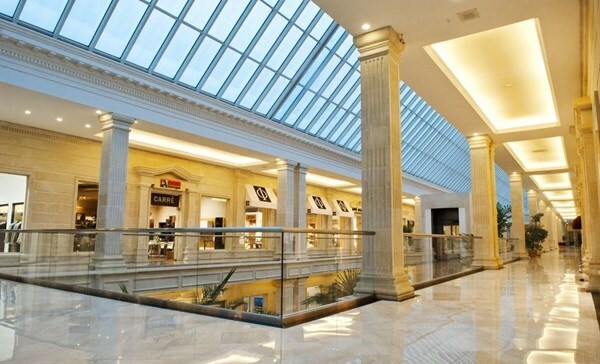 One out of every five malls is expected to close by 2022 – a prospect which has put downward pressure on retail real estate prices and on the finances of the firms that own and manage these venues. In the UK, high streets are struggling through similar issues. And given that high streets have historically been the heart of any UK town or city, there appears to be a fundamental need for businesses and local councils to adapt to the radical changes affecting the retail sector to preserve their high streets’ vitality and financial viability. While attention is focused on the direct impacts on company finances, employment and landlord rents, store closures can set off a “domino effect” on local governments and businesses, which come at a significant cost to society. For instance, closures can have a knock-on effect for nearby businesses – when large stores close, the foot traffic to neighbouring establishments is also reduced, which endangers the viability of other local businesses. For instance, Starbucks has recently announced plans to close all its 379 Teavana stores. Primarily located inside shopping malls, they have harshly suffered from declining mall traffic in recent years. Store closures can also spell trouble for local authorities. When retailers and neighbouring businesses close, they reduce the taxable revenue base that many municipalities depend on in order to fund local services. Add to this the reduction in property taxes stemming from bankrupt landlords and the effect on municipal funding can be substantial. Unfortunately, until e-commerce tax laws are adapted, municipalities will continue to face financial challenges as more and more stores close. It’s not just local councils, but local development which suffers when stores close. For decades, many cities in the US and the UK, for example Detroit and Liverpool, have heavily invested in efforts to rejuvenate their urban cores after years of decay in the 1970s and 1980s. Bringing shops, bars and other businesses back to once derelict areas has been key to this redevelopment. But today, with businesses closing, cities could once again face the prospect of seeing their efforts unravel as their key urban areas become less attractive and populations move elsewhere. Commercial ecosystems featuring everything from large chain stores to small independent businesses are fragile and sensitive to change. When a store closes it doesn’t just affect employees or shareholders – it can have widespread and lasting impacts on the local community, and beyond. Controlling this “domino effect” is going to be a major challenge for local governments and businesses for years to come.